Who knew roads could do so much more than serve as paths for vehicles to get from one place to another? If Japan has roads that heat up to combat snow, then France has a solar road, which was launched in December 2016 in the village of Tourouvre-au-Perche in Normandy, France. The solar road, which is called Wattway, is only 1 km long and is composed of 30,000 square feet of solar panels–and costs €5 million. The goal of the road: to generate power for street lighting in the village. The concept is interesting, though it still remains to be seen whether this will be an effective endeavor. Its future looks bright, if the current situation of the world’s first solar road in Amsterdam is anything to go by; the solar road has been used by around 150,000 cyclists, and it’s produced over 3,000 kilowatts of energy so far. 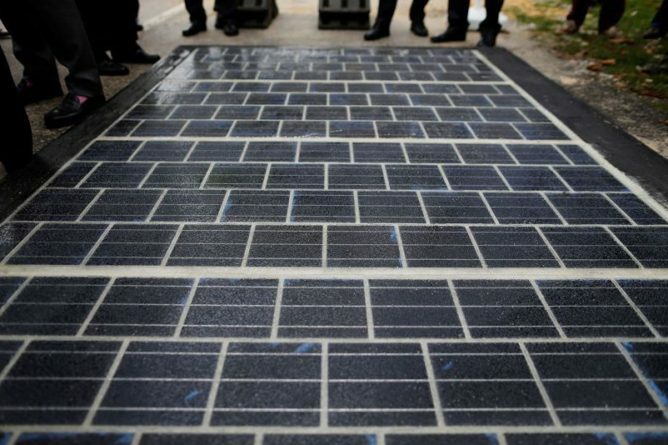 In any case, projects like this solar road can stir up a lot of interest and help people better figure out how to implement other solar projects in different, creative ways. Installing solar power panels on your home is a great way to help out the environment. It is also an excellent way to save some cash because solar power provides electricity to the home for free. Most solar light kits aren’t hooked up to a large battery system these days. They provide power directly to the home as needed and whenever there is enough sunlight. The home remains attached to the grid so that electricity is available even on cloudy days. It’s a good way of helping to ensure that homeowners will always have electricity, but they can also save some money on their electrical bills. There are a few other ways that people save money in using solar power. Adding solar power panels to your home increases the resale value of your property by as much as 20%. That more than makes up for the cost of the panels and the installation.Plus, people love the idea of being able to get off the grid, so you may see your home selling that much faster than other properties without solar power. So, not only do homeowners make money back on their electricity, they also make money back when they sell their homes. Any excess energy produced by the solar panels that you don’t use is funneled into the electrical grid. This extra energy is paid for by the electrical company as a credit on your bill and any extra money is sent to you in the form of a check. This can save the average homeowner hundreds of dollars a month in electricity bills. It’s a great feeling to see the electric company paying you for energy. Homeowners may even be able to get away with installing solar power and other renewable energy production equipment without paying for it. Many companies have something called a Power Purchase Agreement that allows them to add renewable energy equipment to the homeowner’s property at no cost to the homeowner. Then, the company sells the electricity from that equipment to the homeowner at a reduced price lower than the electric company’s price. These are just a few of the many financial benefits of using renewable energy. There is an initial cost to install your own set of power panels, but in the long run, it saves you a lot of cash. 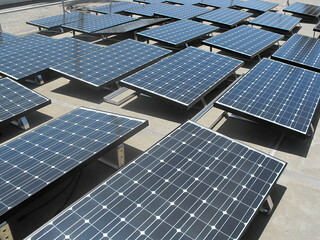 Even just a couple of power panels can cut costs dramatically. And in more news about solar-powered lights in the Philippines: Boni Tunnel in Mandaluyong City, Metro Manila received an upgrade for its lights, being replaced with solar-powered LED lights. Philippine government offices collaborated with the Asian Development Bank, PNOC Renewables Corporation, and Philips Electronics and Lighting Inc. to bring the project to life. Read more about it on the ADB website. 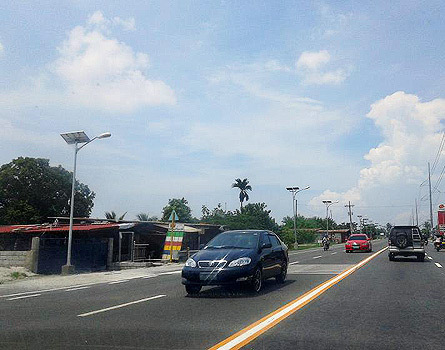 On our way to Bataan the other day, my boyfriend and I spotted these streetlights in the city of San Fernando, Pampanga. They really were a pleasant, welcome sight, especially because we haven’t seen a long stretch of road using solar-powered streetlights before. In Quezon City, we mostly see little lighted signs that are solar-powered, but not actual streetlights or traffic lights. I just wish we could have seen how San Fernando’s streetlights look at night and how bright they get. If they work really well, there should be no reason why such lights can’t be adopted all over the Philippines. So this post is severely late, because my sister Lani and I were in Massachusetts for a quick holiday in October last year. Still, I figured any green news is good to hear. We hung around the Berkshires on our trip, spending a day at the Kripalu Center where we went on a two-hour hike around the area, had some pretty good meals, attended two yoga classes, and in the evening, attended a sort of concert featuring Danya and Eyal. When we had some free time, we walked around Kripalu’s grounds and saw the Annex. The building was designed by Peter Rose of Boston’s Rose+Partners Studio. It uses a radiant heating and cooling system, and also uses “raw wood salvaged from the Hurricane Katrina tidal surge”, according to The Berkshire Eagle (PDF). It also has linoleum floors made from linseed oil. Check out more info on the Kripalu Annex here (PDF). As part of our trip, we visited the Hancock Shaker Village. We walked around after the tour and came upon solar panels used to power the village. Spoon in Lenox gave us a taste of some yummy, organic food when we were in town. I did a review of the place in my food blog. The restaurant pledges to stay local by getting their ingredients from local farmers. Overall, it was a very good holiday, and it really was very nice to see so many places that operate with the environment and sustainability in mind. A restaurant powered by urine? Okay, that doesn’t sound like the most appetizing thought, since nobody wants bodily fluids going anywhere near food. It all makes sense, however, when you figure out how it works. The Greenhouse project, designed by Joost Bakker, is an example of how a restaurant can become waste-free. Aside from using eco-friendly and recycled materials for the structure–including ECO-ply plywood and soybean-based glue–the electricity of the restaurant is powered by canola oil. So where does the urine come in? The restaurant’s toilets are specially made to collect urine, which is then diluted and then used as fertilizer for the restaurant’s crop of canola. It’s a clever, unusual idea which would be nice if it were done on a wider scale. We can’t help wondering about the state of the toilets, though, and how the urine collection is done or if the process promotes cleanliness in the bathroom. A great use for those plastic soda bottles, and a way to save on electric bills. Mabuhay! We have known, for quite some time, that the fossil fuels we use today are a finite source of energy; we only seem to disagree on when those sources will run dry. Alternative sources have been around for quite some time, including electric power and solar power, but none has yet supplanted dead dinosaurs. Presented here are some other fuels, some strange, some downright weird. Trick-or-Treat – University students in England tested a Formula racing car that ran on fuel made in part from waste chocolate from a Cadbury plant. No word on whether-or-not the car was eaten after testing was completed. Gobble Gobble – For turkey-lovers (Ben Franklin suggested, tongue-only-partly-in-cheek, that the turkey would make a more noble national bird than the eagle), the idea of putting a Tom into the gas tank might seem anathema, but viable fuel can be made from virtually all parts of the bird. Starbucks In the Tank – Coffee grounds, which contain a lot of oils, make a bio-fuel that is relatively cheap and clean to produce, comes from an abundant source, and, of course, makes the morning commute a much more aromatic experience. Paper or Plastic? – Both paper and plastic can be made into fuel, and each comes with its own set of advantages and disadvantages, though the future may show us many new ways to recycle waste products in a green manner. Blow Me Down – Wind turbines have been mounted on vehicles, and they have been used to charge batteries that then power the vehicle. This system works best for those who live in tunnel-free expanses of windy salt-flats. Mulch for the Minivan – Not as strange as it sounds, wood chips and sawdust are prime ingredients of what are called “bio-mass” fuels, which are foreseen by some as the most likely replacements for petroleum-based fuels. Styrofoam – With as many styrofoam cups as we see littering our highways, it would be a nice thing to see if economically feasible methods of converting those cups into useful fuels can be developed. Dung Beetles? – Methane gas, available in all your friendly neighborhood cow-patties, can be rendered into fuels that can run an automobile. Beans, Beans, They’re Good for Your Car – Beans, soybeans in particular, are used to make bio-fuels, and are among the few sources that show real universal promise. Lend Me Your Ears – Ears of corn, that is; ethanol is a fuel already in wide use around the globe, and can be made from crops such as corn, potatoes,sugar cane and the ever-popular manioc (known more commonly as “cassava”, one of the most-eaten sources of carbohydrates on the planet). Henry Ford was using ethanol in his Model T’s as early as 1908. You won’t be able to run your car on tap water any time soon, but hydrogen (the “H” in H2O) is seen as a leading candidate to replace world dependency on fossil fuels. Stay tuned.